Two women crawl ashore a bleak rocky island. Soaked to the skin, with adrenaline surging through their veins, Robyn and Helen ecstatically cling to one another. They have both miraculously survived the capsizing of their rented boat unharmed, save for hawking up mouthfuls of seawater. 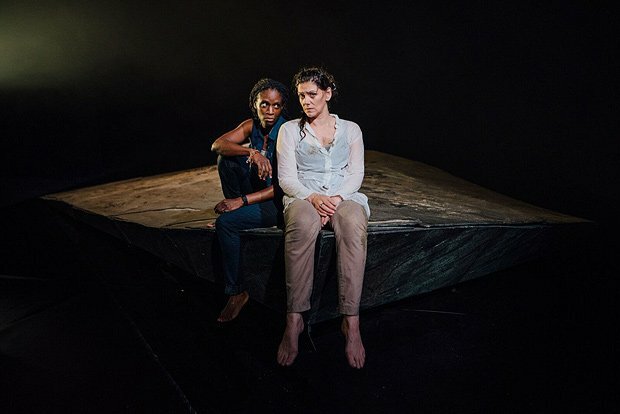 Originally presenting itself as something of a survival drama, Zinnie Harris' new play for the Traverse is a slow burner. As the couple grapple to understand what is happening to them on this otherworldly island, it becomes clear that neither of them have really survived at all. Helen (Sharon Duncan-Brewster) was killed in the accident while, in the living world, Robyn (Neve McIntosh) is drowning in a maelstrom of grief. Director Orla O'Loughlin deals with the complexities of this liminal, uncanny experience with a delicate touch, but there is nothing gentle about the grief on display here. McIntosh and Duncan-Brewster are outstanding, their utterly convincing relationship reminding us of the unfathomable impermanence of even the most profound love. Towards the end, the play does begin to meander as though hesitant of reaching a conclusion – but then, anyone who has lost a loved one will understand the yearning for just ten more minutes. Traverse, until 27 Aug (not 14, 21), times vary, £21.50 (£9.50–£16.50).